Honda presents, the '90s-themed trim for the all-new Passport. The Pastport. The authentic look of the new Passport on the outside, yet simplified with everything you love about the '90s on the inside. A trim exclusively built for those who are looking for that next step of self-expression and uniqueness. 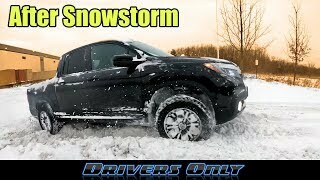 Honda Ridgeline Off-Road Testing after SNOWSTORM - Can It Handle Deep Winter Snow?